The outcome of a conference, this is collection of essays edited by R. Victoria Arana, a Professor of English at Howard University, Washington DC. The book was first published by Cambridge Scholars Publishing in 2007, reissued in 2009. The larger proportion of the book’s contents does not deal directly with the visual arts. There are however, a number of chapters that focus on British artists such as Yinka Shonibare, Martina Attille, and Roshini Kempadoo. From the book’s back cover: “ “Black” British Aesthetics Today is a collection of twenty-four exciting critical and theoretical essays exploring current thinking about the hottest artistic, literary, and critical works now being produced by ‘black’ Britons. 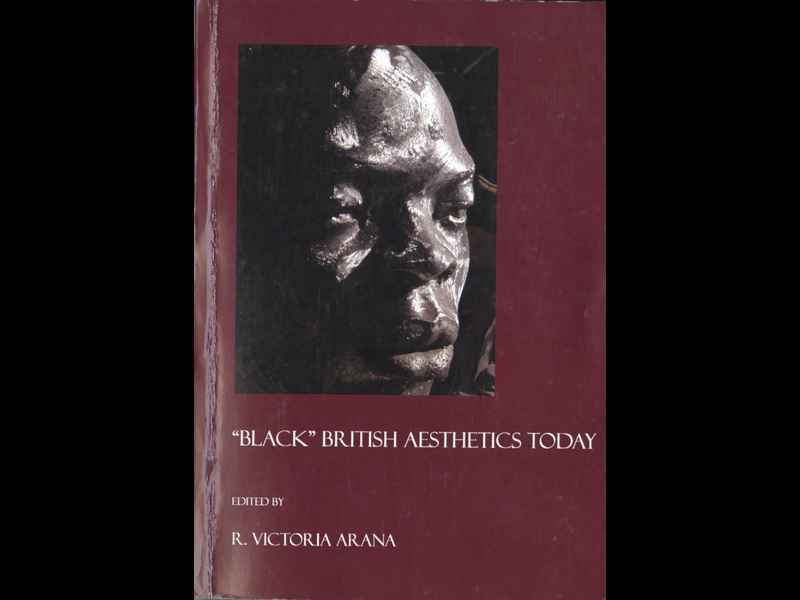 This book features a number of chapters by the avant-garde ‘black’ British novelists, poets, and artists themselves. It includes, for instance, aesthetic manifestos by Diran Adebayo, Anthony Joseph, Roshini Kempadoo, Sheree Mack, Valerie Mason-John, and SuAndi as well as key essays by globally renowned critics, including Amna Malik, Kobena Mercer, Lauri Ramey, Roy Sommer, and many others. As a compendium, this book represents a powerfully fresh intellectual current of thought. It provides readers with important insights into contemporary ‘black’ aesthetics, and it includes an array of important clarifications initially voiced at the groundbreaking international symposium that took place on April 8, 2006, at Howard University in Washington, D.C., by outstanding new scholars in this burgeoning field of study: e.g., Kevin Etienne-Cummings, Valerie Kaneko Lucas, Michael McMillan, Magdalena Maczynska, Courtney Martin, Jude Okpala, Deirdre Osborne, Koye Oyedeji, Meenakshi Ponnuswami, Sandra Ponzanesi, Andrene M. Taylor, Samera Owusu Tutu, and Tracey Walters. Introduction by the editor, titled Aesthetics as Deliberate Design: Giving Form to Tigritude and Nommo. Chapter 9. The Continuous Diaspora: ExperimentalPractice/s in Contemporary Black British Poetry. Anthony Joseph, Poet, South Thames College, London (erroneously written on the contents page as South James College). A note of caution. There are a number of factual errors contained in the book. For example, Mercer’s text, “Diaspora Didn’t Happen in a Day”: Reflections on Aesthetics and Time erroneously states that Chris Ofili “won the 2002 Turner Prize”. The year was in fact 1998. Elsewhere, in Chapter 16. Migratory Aesthetics: (Dis)placing the Black Maternal Subject in Martina Attille’s Dreaming Rivers (1988), by Amna Malik of Slade School of Art, she states “One might also mention the work of Guyana-born artist Hew Locke.” Locke was in fact born in Edinburgh.